As economic woes worsen, peak oil hits, and other problems loom, you can reduce your dependence on the centralized delivery systems for the food, energy, water, and money by turning your home into The Resilient Household. The economy is dismal. Real unemployment is at post-WWII highs. Most 401Ks have been hammered; pensions are widely undercapitalized, with many at risk of failure. The warnings about the potential for hyperinflation, deflation, and/or currency and banking crises are growing. The International Energy Agency has finally admitted peak oil is a real threat. Other former peak oil refusniks are following suit, with almost everyone now agreeing that oil supply constraints are coming. Oil prices have already risen to just below the point where they wreak havoc on the global economy. If the dollar tanks, US fuel prices will spike and shortages will be inevitable. The US electricity grid is dilapidated and evermore prone to outages. Global grain supplies are at all-time lows. Agricultural productivity problems are growing due to ever-freakier weather. The typical grocery store has a three-day inventory of food. Many regions are having increasing problems with adequate, consistent fresh water supplies. These potential trouble points ahead may cause disruptions to life as we have known it in the last half-century. Most of us would rather not think about such problems, preferring to leave the solutions to the people we elect or otherwise pay to worry about such matters. But you may be shocked, shocked to find out that our elected officials are largely not worrying about these things; in fact, their actions and lack of leadership are largely to blame for the problems. We all hope life will continue going along more or less apace. Most people are betting that if events do happen, they won't be too bad. But there are many realists among you who think it might be a better idea to "prepare for the worst and hope for the best." That means reducing your dependence on centralized, just-in-time delivery of food, energy, water, and health care products. This article will provide basic guidance on how you can switch to a just-in-case approach that can also save you money. 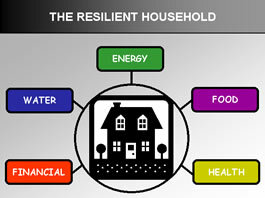 The Resilient Household concept breaks the tasks down into five primary areas: Financial, Food, Water, Energy, Health. The follow-up article in the household resilience series covers seven more areas. Each section below has a short background statement followed by actions you should consider, listed in priority order. This document has been kept brief to make it manageable and to avoid overwhelming the reader. We urge you to do additional research, both to make sure you firmly accept the premise of the article and to hone the strategies to suit your individual situation, needs, and resources. So far, bank regulators have seamlessly handled the swelling number of bank failures (which are usually presented to the public as bank mergers and acquisitions). Still, the FDIC recently "ran low on funds," and the high exposure of the banking industry to toxic derivatives (which have yet to be cleaned out) says there is a rising possibility of a 1930s-style bank holiday or a mega bank failure that would breach the FDIC levee. At the same time, huge numbers of new dollars (Federal Reserve Notes) are being created by the Federal Reserve (banksters) and loaned to the US treasury, ostensibly to stimulate the economy and keep too-big-to-fail financial institutions from failing. But this is likely to create a future wave of inflation, which will erode your purchasing power. On the other side of the knife edge, a bursting of the quadrillion-dollar derivatives bubble or an outright collapse of the US dollar would send the global economy into chaos, leading to disruptions of credit cards, banking, and all other factors of daily economic life. Keep Emergency Cash — If your savings and income allow it, keep enough cash on hand for X months' worth of family expenses. "On hand" means safely stored somewhere other than a bank. You decide what X should be. Be Diversified — If you have substantial cash holdings, diversify your bank accounts—that is, have several banks at which you can draw funds. Include at least one locally owned bank or credit union among your choices. tools, equipment, systems, and supplies related to the means of future production, especially for food and energy. This locks in the value of your money at today's prices and offsets future recurring expenses, avoiding the problem of trying to make your savings-account interest rates or investment returns keep up with inflation (which they won't). The definition for the first category excludes perishables, but there are many food items that will last for several years if properly stored (and rotated). Minimize Debt — Do your best to minimize debt, especially debt where being unable to pay a would result in forfeiture of an essential asset. All that newly printed money has to go somewhere, and that's one of the reasons the stock market indices have stayed elevated despite the continually bad unemployment news (which is a much truer indicator of how things really are in the economy). If the US money supply keeps expanding, that trend may continue, and we may even see new market highs. But such a situation would be a race between the increasing value of your stock portfolio and the declining real purchasing power of the stocks' dollar-denominated value. Stocks could conceivably keep going up in dollar terms as their true value declines in absolute terms. Some people think that precious metals (especially gold and silver coins) are a sound way to protect some portion of their money from inflation or other financial problems. We are not going to comment for or against that proposition—the answer depends on each person's particular financial situation. However, if you do decide to follow the yellowbrick road to the silver city, we advise that you take physical possession of whatever you invest in. That is to say, investing in a gold fund or having a paper certificate that represents a stash of gold held somewhere else is not as good as having the stuff in hand. At this point, though, physical gold and silver are getting much harder to come by, so you may find that the other ways of protecting the value of your money—like investing in food-production infrastructure or alternative energy for your home—make more sense. We wrote extensively about the threats to the food system in our food crisis series. If you are unaware of the problems facing our farmers, the grocery store system, and food in general, please review those articles. Establish a Food Buffer — Maintain a "buffer supply" of food equal to at least X months of your family's consumption. Again, you decide what X should be (however, we think 3 is a good minimum). Go Local — Growing your own food is as local as "local food" gets. Convert as much of your yard as possible to garden beds for food production; plant fruit and nut trees as well as berry bushes. Invest in the equipment and supplies needed to preserve food—and learn how to do it safely. Our food-gardening books page has many good books that will help you minimize mistakes in planning and implementing garden spaces as well as preserving food. Shopping at your farmers market or buying from other local-food purveyors is a great way to be resilient and support the local economy. Consider joining a CSA if you can find one near you. Our food security article has more information on these approaches and has many more ideas that can add to your "food resilience." Water mains can fail, disrupting taps for hours or days. Likewise, if a pumping station's power goes out, water contamination problems may rise or there may be a complete shutdown. Water prices are also going up, and watering your new garden all summer may cause sticker shock on your water bill. Store Drinking Water — Store X day's worth of drinking water. The rule of thumb is one gallon per person per day. The minimum X is 3. Glass is the best storage medium since it is completely non-reactive (unlike plastic). But if you can't find enough large glass containers, storing water in one-gallon plastic water jugs—no old milk containers, please—is better than nothing for an emergency. It's best to keep stored water in the dark to reduce growth of algae or other biological contaminants. Get a Tap Filter — Install a high quality water filtration system on your kitchen sink. Make sure it can filter biological pathogens. When shopping, it's smart to compare the capabilities of the filters you're considering to the last few annual water quality reports from your water company to make sure your filter will match up well against the problems most likely to show up in your water. We've found the Aquasana under-sink filters to be quite good. Capture Rainwater — Have sufficient rainwater capture capacity to supply your family with drinking water for three weeks. Be Able to Filter Rainwater — Have the means to treat or filter your captured rainwater. 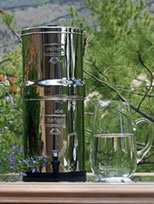 Some people are satisfied with chemical decontamination, but for those who prefer to avoid chlorine and other chemicals, the Big Berkey water filter is widely recognized by preppers as the top gravity-fed water filter. You can support Grinning Planet (which is a completely free site) by buying your Big Berkey or Aquasana filter setup via these Amazon.com links, at no additional cost to you. Capture More Rainwater for Gardening — Install additional rainwater capture capacity that can also be available for watering your garden plants during dry weather. Keep watch at Grinning Planet for our upcoming articles about rainbarrels, cisterns, and roofwashers. In the post-deregulation era of privatized power generation, the juice has kept flowing and shareholders' profits increased. The trouble is, the latter came at the expense of investment in new generation capacity and upgrades of the electrical grid. There is broad consensus among electricity analysts that the grid is old and evermore prone to failure, and that the likelihood of a another major outage like the 2003 Northeast grid outage is not "if" but "when." On the fuel front, if the dollar has big problems, oil supplies in the US will have big problems. The results at your local gas station will not be pretty. However, this page will focus on resilience for home electricity and heating; transportation has its own section in part 2 of the series. Get Electricity Backup — Have sufficient battery or generator backup to keep your refrigerator(s) and freezer(s) running for at least three days. Generators can be sized to also support a space heater or two, but battery backup would likely be insufficient for that. Get Efficient — Reduce your electricity (or heating fuel) requirements by improving your home's insulation, doors and windows; investing in energy-efficient appliances; modifying your habits to save energy; and doing anything else that will save electricity and money in the long run. Get Free Energy from the Sun — Begin learning and using passive solar techniques. If you can afford it, add solar hot water and/or solar PV. 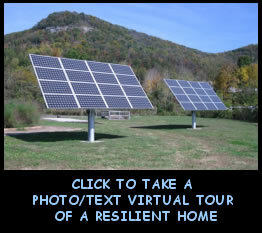 See our home solar energy article for more info. Be sure your battery backup can be recharged from the PV panels if the grid is down—believe it or not, many systems cannot do this—and make sure the pump for the solar hot water heater's coolant loop is on a backed-up circuit (or powered by separate PV panel). Heat with Wood — If you live in an area with decent woodlands and reasonably priced firewood, consider a wood stove (or wood stove insert for your fireplace). During a winter power outage, a wood stove can keep you warm and provide an alternate way of cooking meals. WoodHeat.org is a good place to get educated about wood as an energy source. Whether your worst-case scenario looks like fuel disruptions, a long-term power outage, or a global financial collapse, goods and services we take for granted may not be there, and that includes medications. Additionally, basic emergency preparedness is always a good idea, and most of us are under-prepared on that front too. Have First-Aid Supplies On-Hand — Keep a broad range of basic health care and first aid supplies on-hand. Increase Buffer Supplies Of Critical Medications — If you have the option of refilling prescriptions earlier—before you're down to your last few doses—do so. Have Hygiene Supplies On-Hand — In the same way that you keep a buffer supply of food, store extra soap, toilet paper, and any other items essential for personal hygiene. Get in Shape — This is a good idea generally, but we all may be growing more of our own food in the future, and while that's enjoyable and rewarding, it's also hard physical work. We may also be finding ourselves biking to work or doing more of our own household repairs/maintenance in the future. Making sure our bodies are ready is smart. Maintain Your Relationships — When discussing which steps to take to develop a resilient household, couples sometimes disagree, which may cause discord. Alternately, a gung-ho prepping agenda may leave little time for doing the fun things in life that help keep relationships strong. The typical household is very busy. If you do decide to undertake resilience activities, sacrificing some luxuries and leisure activities to free up time and money is a given. You may find that you enjoy some of these new activities even more than the things you gave up! But it is important find the balance the works for every one in the house—or is at least to arrive at a fair compromise. Don't achieve great things in your resilient household only to make your relationships unsustainable! Kick the Habits — Address any habits where you wouldn't be able to easily "do without" for a period of time. Also try harder to address any lingering or long-ignored health issues. Entering a period of chaos with such functional liabilities is something to avoid. Address Long-Term Medications — If you are on medication but think you could be off medication by modifying your diet and exercise habits (or by other, natural means), do so. But please consult with your physician before beginning any such undertaking! Preparedness takes time and effort. It can also take money, but done correctly, it can save you money in the long run. There is one thing preparedness will bring that cannot be affixed with a price tag—peace of mind. Remember, while personal preparedness is an essential first step, getting our neighbors and communities pointed in this direction is also important. You can hook up with individuals interested in resilience, sustainability, and relocalization by searching out groups in your area via the Transition US web site. For other countries, check out this page from the Transition Network. Know someone who might like this article about The Resilient Household? Please forward it to them. In part 2 of the household resilience series, we tackle topics like security, transportation, and communications. Shopping at Amazon via the links on this and other pages on Grinning Planet helps support our effort to inform the world about peak oil, our broken political and economic systems, resilience, and green solutions. Thanks! This is Part 4 of a five-part series. You can sign up for the free GP email service so you don't miss any of our other great articles. When Technology Fails provides information that will help the average person become more self-reliant, outlining survival strategies for dealing with changes that affect food, water, shelter, energy, health, communications, and essential goods and services. In an era of super-storms, burgeoning population, massive earth-quakes, global warming, and record-breaking floods and droughts, more and more people are seeking to prepare themselves to deal with the difficult times that may lie ahead. Robin Wheeler extracts logic from hysteria, packages it with a strong environmental perspective, an abundance of practical suggestions, and good humor. Written for anyone interested in surviving whatever disaster comes along, this book will appeal to both long-time food security advocates and newcomers. Chapters are devoted to useful, transferable skills, including: preserving garden food; saving freezer food during a power outage; managing through an earthquake; preparing quick herbal medicinals; foraging for wild food. In hard times, families can be greatly helped by growing a highly productive food garden. Gardening When It Counts helps readers rediscover traditional low-input gardening methods to produce healthy food, showing how a family can halve their food costs using a growing system requiring just an occasional bucketful of water, a couple hundred dollars worth of hand tools, and about the same amount spent on supplies, working just an average of two hours a day during the growing season. Emphasis is put on root systems and irrigation of plants, how to fertilize, and how to control pests organically. Vegetables are also ranked by their difficulty to grow.